We had a few menu changes last week, so I shifted the menu around. 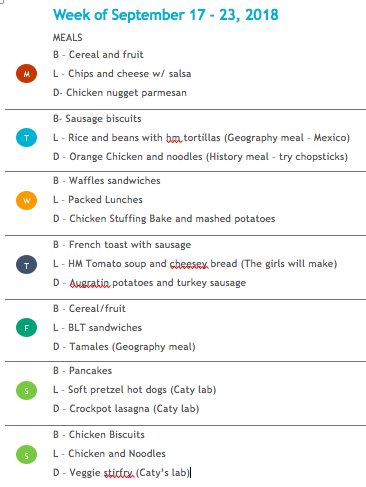 Caty has a couple cooking labs she needs to do for class. I do keep our menu posted on the fridge and I check it each morning to keep track of what I need to start. I also make a note on my weekly to-do list if I need to make something ahead of time. I'm hoping maybe we can get a bigger freezer one of these days. Then I can freeze some meals ahead of time!! This week we are traveling to Mexico in Geography. For History we will be visiting Ancient China and Japan. So our Geography lunch is on Tuesday and Friday. 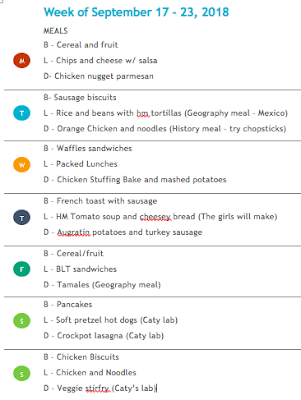 And our history meal is on Tuesday this week, due to scheduling issues. What's on your menu this week?? Favorite recipes? ?